Speak to a mediator in confidence now & receive a free no obligation appraisal of your options. Our mediators cover the whole of the UK, have high success rates & are cost effective, let us resolve your dispute today! All the below fields MUST be completed before you can send this form. His mediation style is commercially focused and pragmatic, yet friendly and relaxed. Mediation Dorset, our Dorset mediators live, work in and cover the whole of Dorset & the surrounding areas. Being local our Dorset mediators can be with you within days, with no charge for travel time or costs. 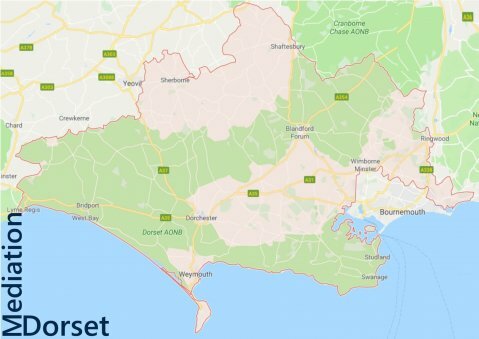 They have been providing Dorset mediation services for several years in a cost effective and confidential manner, covering every type of commercial, workplace, employment, family and neighbour dispute, with a very high success rate. Have a very high success rate. Have good availability and can be with you within 5 days. Cover the whole of Dorset. Specialise in all disputes covering all sectors (commercial, workplace, employment, family & neighbour). Come from a variety of professional backgrounds. Accredited and trained through one or more of the following mediation training bodies, CEDR, the Chartered Institute of Arbitrators, the Academy of Experts, ADR Chambers and the ADR Group, who are considered to be amongst the leading mediation training institutes in Europe. Let us save you money, time & stress, end your dispute today!
" I thank you for exhibiting your Mediation skills in this case and am satisfied that had it not been for the expertise that you showed throughout the Mediation process then this matter may well have not been resolved and may have continued to an expensive hearing." " The parties had become somewhat entrenched, the Court proceedings had not been pursued with any great vigour and there appeared to be no solution in sight. Our clients and us would like to thank you for assisting the parties in coming to a settlement on the day of the mediation and we would certainly recommend you to other solicitors." " I was very pleased by your assistance in this matter having received a report back from Louise Campbell - Brown who was equally as complimentary. In fact I have recommended your services to at least two other commercial dispute clients and I may revert to you in respect thereof shortly." " Although negotiations were difficult... a satisfactory result was founded at mediation. I thank you for your assistance, without which a fair resolution would not have been achieved. Eric Bowes are happy to recommend you to others." " I am writing regarding your recent involvement with Victim Support and the help which you gave us by providing a mediation service within our organisation. As you know, I had been experiencing some difficulties which were occupying a disproportionate amount of my time and which certainly required the intervention of an independent organisation in order to achieve an amicable resolution. I am pleased to tell you that your mediation has proved successful and that there has been positive feedback from the individuals concerned. I would like to thank you and am grateful for your urgent attention to my request for assistance. Should the need arise, I would be happy to utilise your services again." " Harvinder's quiet but determined approach was the difference between the case settling or proceeding to a litigious end. This was a classic example of how to mediate a dispute." " I genuinely believe that if it wasn't for your professionalism and assistance, the parties would not have settled on the day. My client informed me that he was extremely pleased with the outcome, I will certainly recommend you to other solicitors." " Had this case not have gone to Mediation it would have ended up before the High Court in London for trial by jury. Your interpretation skills were clearly an advantage which was one of the reasons we chose you to mediate. My client was pleased with the outcome and that he can now lay this matter to rest." " Thank you for acting as a mediator in this matter. I found you to be skilful and professional and your involvement certainly led to settlement of the dispute." " ...You recently conducted a mediation... The issues related to a boundary dispute which had been ongoing for many years and which was headed inevitably towards very expensive litigation. My clients and I found you to be professional and effective and I am pleased that this very acrimonious matter has now settled. Thank you for your assistance I would not hesitate to recommend you to other firms." " Should I need further assistance in the future, I will have no hesitation in recommending your services." " This was a professional negligence case where there was a significant amount of ill feeling and I felt you controlled the position extremely well... I found your flexibility to be very useful in keeping down costs. As you know I was able to participate in the mediation by telephone which meant that my charge to the client was greatly reduced and in the end the matter was settled satisfactorily." " Neither my client nor myself had been through a mediation process before and we would like to thank you for your assistance in helping us to reach a settlement. My client found you to be very fair and willing to take time to hear all our issues - sometimes in great deal. I believe that this helped diffuse any tensions that existed at the outset and assisted both parties in breaking free from entrenched positions to try and find a workable solution." " My clients and I were impressed with the resilience, pre mediation preparation by you. I was also impressed with how you focused the parties on a solution and indeed facilitation of the same. We choose you as we were impressed with your CV which displayed your extensive mediation experience, which bore fruition. I would happily recommend you to other law firms." " The request we received for instructions were clear and concise and were helpful in setting the agenda for the Mediation. The Mediation was conducted quickly and concisely, taking significantly less than a full day, due to the timing and tempo provided by the Mediator. Overall the Mediation was settled quickly between the parties, giving an effective and speedy resolution." " After all this time we were able to reach a settlement with which both sides felt they had had some success, and therefore saved face, which negated the necessity for a very expensive two to three day trial. My clients were pleased with the outcome, did not feel browbeaten in anyway which I have seen in other mediations, and are therefore happy with the result." " Your in-put in bringing the dispute to a palatable conclusion was very valuable indeed. Both myself and my colleague were struck by the tenacity that you showed in dealing with one of the parties' whose position had become particularly entrenched." " Both my client and I, found you to be competent, friendly and professional throughout the whole process, we are both grateful that this matter was not re-listed before the Court and that you were able to facilitate a satisfactory settlement of this dispute." " ...The sum of money being claimed was in excess of one hundred thousand pounds (£100,000). My client and I found you to be competent, friendly and professional throughout the whole process, and were delighted how quickly you were able to assist in facilitating settlement given the complexity and length of time the dispute had gone on." " A party wall award had been appealed in the county court, and unfortunately both parties had racked up considerable legal fees, even prior to a final hearing of the matter. All parties were therefore concerned that no more unnecessary legal fees be expended. All of the outstanding issues were addressed and resolved through your mediation skills without which this dispute would have undoubtedly been listed for a final appeal hearing, thus still causing the parties considerable time, stress and expense. I would therefore like to thank you for your skill and help, and I would happily recommend you to other barristers, solicitors, and litigants in person." " The Claimant and Defendant had become entrenched and were no longer even on speaking terms. The costs which you undoubtedly saved both parties, in addition to the time and inconvenience, cannot be underestimated. My client was very impressed with both your attitude and manner during the whole process. Without your assistance I am confident that we would not have been able to reach settlement." " My clients were delighted how quickly you were able to facilitate a satisfactory settlement, bearing in mind the significant amount of evidence that each party had put forward and the length of time our dispute had gone on." " Bearing in mind this dispute had been going on for nearly 2 years, you assisted us to facilitate a solution within a day... saving us the expense and time of a trial." " I found the mediation process to be quick, cheaper than going through litigation, and your mediation skills certainly were the reason for us being able to resolve the matter on the day." " Having not attended a mediation before we were not exactly sure what to expect, however we found your approach comforting... we appreciate that you diffused a number of potentially deal breaking moments... and lead us to a solution which was agreeable to all... My wife and I wish to express our thanks to you for giving up your Saturday to mediate this dispute, bearing in mind it took all day, I would definitely use mediation again..."
" You are a real expert and I count you as one of the leaders in the Mediation field, I would have no hesitation in recommending you as a Mediator or Mediation Trainer." " ...The Academy of Experts has appointed you as the lead Mediator on 14 occasions. All of these appointments have been Commercial disputes, and the nature of the disputes have varied from a few thousand to hundreds of thousands of pounds, and ranged from breach of contract, housing disrepair to probate disputes." " ...The dispute... had been going on now for a considerable period of time... we were delighted how quickly you were able to facilitate a satisfactory settlement, bearing in mind the position the defendant initially took." " Your down to earth approach, and the fact that you treated me like a human being rather than another case number was refreshing... This matter was resolved and concluded in a day which allowed me to focus on my business and not take up months of my time and the considerable expense of preparing for trial." " The cases were all of a consumer and or contractual nature and varied in value from a few hundred pounds to several thousand pounds. The feedback from the disputants was very positive and many commented that they would not have pursued their complaint without your assistance." " I wish to put on record our gratitude to you for the patience and time given in order to reach this settlement." " I was more than a little worried that I would be intimidated into a decision that would have been unfair... However with your skills available to me, I believe that the correct result was found..."
" ...Our solicitor, my partners and I, were impressed with your expertise and how quickly you grasped the issues in dispute, as well as the underlying not so apparent issues, which you subtly tackled at the appropriate times... due to your mediation skills we achieved all of our objectives." " I was the Part 20 Defendant in a landlord and tenant dispute... After an afternoons negotiations, and coming close to walking away without settling, a settlement was achieved, I wish to thank you for your diplomacy and mediation skills, as it was a long afternoon, a 3 party dispute with 7 people for the claimants, and although I was not represented and the other 2 parties were you ensured that the process was even handed..."
" With regards to the recent mediation you conducted between Cousins and one of our customers, I wish to thank you for your assistance... Similarly we successfully settled a previous dispute you mediated for me in October 2003 and I would not hesitate to recommend you..."
" His knowledge of the mediation process is commendable and he is a real credit to the CIArb." " Both my colleague and I... were delighted how quickly you were able to facilitate a satisfactory settlement, bearing in mind the complexity and length of time our dispute had gone on..."
" ...You were involved in the resolution of hundreds of disputes whilst employed as an Alternative Dispute Resolution (ADR) / Civil Mediator for Sandwell Mediation Services... I would have no hesitation to recommend you as a Mediator." " Your input was instrumental to an agreement being achieved; within four hours you managed to somehow lead the parties to a solution, bearing in mind they were poles apart at the beginning of the session and a solution did not appear to be possible initially." " …acrimonious boundary dispute…further complicated the claimant was the defendant’s brother, whereby they were not even on speaking terms to one another, resulting in other family members becoming drawn into the dispute and proceedings being instigated and three years worth of litigation…you managed somehow to lead the parties to a solution and avoid an expensive court hearing. We are grateful for your assistance and would readily refer you to other law firms." " Within two and half hours, you managed to get both parties to an agreement, bearing in mind this had been ongoing for 6 years...I am pleased to say the client got back approximately 45%o of his claim ... bearing in mind the defendant was initially refusing to pay anything ... I would be happy to use you again and recommend you to other law firms." " Harvinder had the ability to direct the parties' minds to what is usually the most essential issue, namely commerciality and maintaining the parties' attention was able to bring the parties to reach a compromise"
" … never attended a mediation before … a contractual matter … a commercial deal was done … you saved us money, time … hassle … I was surprised at how quickly you got us to a solution…"
" There were several issues in play; the main ones being a company, business dispute over an oral contract between the parties concerning an exit strategy and purchasing of a business...You managed to bring this year long dispute to an end within two and a half hours...a satisfactory resolution was founded, which would not have been possible without your mediation expertise, I would have no aversion in recommending you to the rest of the profession." " I am grateful for your assistance on Monday for bringing this two-year long dispute to an end within four hours…My client and I found you quickly understood the issues in dispute, bearing in mind you only had the mediation bundle shortly before you were due to mediate…"
" … A highly sensitive matter…You were absolutely fantastic … Remaining impartial…Having been let down by a different mediation provider … You are our choice of mediation provider." " You have mediated for clients of CSK Legal on three separate occasions and that, on each occasion, settlements have been achieved … You had an ability to grasp the fundamental issues quickly, develop trust and confidence, and quickly build a rapport because of your firm, polite and professional manner." " …you have mediated 195 telephone mediation cases for us which have all concerned disputes between landlords, tenants and where applicable their agents…Equally you mediated and resolved in one day a very complicated family dispute which had been ongoing for five years. The claimant father was suing his daughter and son in law (defendants) for £1,790,000 over properties, you conducted the mediation in Punjabi at times as the claimants first language was not English." " …the delegates were all senior government officers, lawyers & judges…we are grateful you wrote & delivered this bespoke training program for us at such short notice. What enhanced the theory were the real-life examples of the cases that you have mediated which reinforced the learning…a real expert in the mediation world, the training you delivered actually exceeded our faculties expectations, a view which was shared by all the delegates. We have further training coming up in Dubai and Nigeria, which we will require your value input on. " " …mediating our very complicated workplace dispute for the MOD Schools in Cyprus…four members of staff…alleged bullying, disability discrimination, unlawful deduction of wages, a grievance, as well as an Employment Tribunal claim being lodged…We required a mediator with a wealth of experience and your work mediating in different countries was of benefit to our case…You made the parties feel at ease managing to build trust and rapport quickly…led them to a solution. " " You ensured that you conveyed all of your extensive expert knowledge … to the elite of the Turkish legal and mediation world…the delegates were Lawyers, Judges, University Lecturers / Professors, Arbitrators, some were also Mediators (who had already received CEDR Mediation Training), to include Mediation Trainers and the first ever Turkish Mediator…you went over & beyond, delivering advanced mediation techniques…truly did surpass all of our expectations, a 100% pass rate, bearing that in mind we are planning on having another training session in 2017, which we want you deliver…The fact that you built rapport very quickly, combined with your down to earth approach and good sense of humor, made the training that much more enjoyable, I freely endorse you as an expert mediator and mediation trainer. " " Lack of trust, suspicion, strong personalities and miscommunication …alongside several underlying issues, which you quickly identified and very diplomatically handled…led to the two employees not being able to work alongside each other…It was reported back to me that you used a great deal of tact, diplomacy and empathy, as one of the employees was extremely emotional, taking the time to listen to both employees at length. The solution which you helped the employees arrive at, allows for them once again to work alongside each other." " …we had two employees who had a number of issues with one another, stemming from a number of new changes which had been implemented, one being a senior member of the organisation…Lack of trust, suspicion and alleged ineffective communication were all key drivers which were fueling the dispute, alongside some underlying issues…overall, they found the process useful and constructive and you managed to resolve this year long dispute. I would of course happily recommend you to other organisations." " I contacted you on the 10th May 2017 and within a few days you had the mediation set up, to include liaising with me over the weekend to ensure all was in place…The Trustees and I wish to place on record our thanks for helping to put this sensitive dispute ‘to bed’ in less than one day, especially as it had been going on for a considerable period of time…allegations of bullying and negligence as a result of a manager whistleblowing. This then led to the manger making a formal complaint against a senior member of our organisation…not only were you the first to respond to our enquiry unlike some of your competitors, some who did not even respond, but as pre-mentioned you promptly set up the mediation and more importantly got the parties to settle. " " I observed you mediate a very complicated three-party dispute yesterday...a business acquisition … the situation became untenable…directors instigated proceedings against the two consultants for £150,000. The parties were extremely difficult, driven by emotion & principles. It was a long day, with difficult conversations to be had, with both camps, which you did not shy away from, and handled sensitively, yet firmly … The dispute had been going on for over three years, but you somehow facilitated the process and got the parties to a settlement within seven hours. It is an understatement to say that your mediation skill set is impressive…"
" … complicated finance dispute over a credit agreement … against a well-known large defendant finance company... going on for years; the correspondence was substantial … claimant was uncompromising and not the easiest of personalities to manage… during the six hour mediation you diplomatically persuaded him to reflect on his own behaviour…with the defendant finance company and their solicitors…You were able to help him manage his expectations and eventually … both parties reached a settlement they all found acceptable. " " I am a former employment lawyer of 30 years, & employment judge…a complicated dispute…breach of contract between a company…following a house fire, insurance claim …I was fascinated …you magically led the parties to an agreement in 5 hours, the dispute had been going on for 3 years…parties were extremely difficult, highly emotive … with immense patience & a light touch of humour at exactly the right moments, you diluted the hostile atmosphere & kept the parties focused…I saw you display a myriad of exemplary mediation skills …you tried various different options, which you knew how & when to use based on your extensive mediation experience, until one worked. It was a pleasure to watch a true expert mediate, and I must say I learnt a great deal. As a former employment judge, I was impressed by what you achieved. It went beyond what a court might hope to achieve. This mediation was a master class…it gave me something to aspire to." " My clients had never attended a mediation before & were quite apprehensive … you made them feel at ease … difficult & emotional day, which you assisted them through & somehow led them to a settlement … impressive it took you a day … this dispute had been ongoing for nearly three years…"
" …my clients were very upset & sensitive about the dispute …hit an impasse more than once, including each side having made ‘bottom line’ offers. After some tense final negotiations, the parties reached a settlement (within five hours). I attribute that to the dogged determination with which you pursued a mediated agreement. You had previously conducted a mediation for a colleague in my team, which also resulted in a successful outcome. " " …You have mediated three different disputes in which I was instructed, I am pleased to say that, on each occasion, all three disputes were resolved successfully…November 2008 neighbour / property dispute…November 2009 landlord & tenant… March 2017 commercial landlord & tenant matter…an ability to grasp the fundamental issues quickly, develop trust & confidence & quickly build rapport. Your fees were also very competitive…"
" Required a mediator for a complex dispute with extensive workplace mediation experience, understood employment law & the way employment tribunals operate … who could mediate within 8 days… Impressed you resolved this within 5 hours … had been going on for over half a year … got to us on time despite all the traffic … arranged the mediation within 2 days … We’d recommend EDSL to others for workplace mediation … impressed by your references… know why those organisations had written such glowing references…will certainly be engaging your services if the need for mediation should arise again." " Harvinder you were vital in reaching an agreement, which you somehow got us to within two and a half hours …I can move on with my life…I am not quite sure what you did or said to him in private, but it certainly worked, finally he started to make offers and to negotiate, which led to an amount which I could agree to." " …thank you for bringing this three year dispute to a close within hours … claimant brought a sub lease which turned out to be a head lease…a fire damaged the premises…landlord refused to claim on the insurance policy…it was far from an easy matter …I would request your mediation services again & refer you to other law firms"
" ...complicated commercial landlord tenant dispute. I do not know how the claimant was encouraged to make an apology but assume that it was a consequence of your intervention. After this the parties started to negotiate constructively...This amounted to a remarkable result achieving a settlement within about 7 hours, dispute that lasted for over 3 years...the second mediation concerned building work .... was all the more impressive as it was a telephone mediation ... just as effective as a face to face mediation but at a significant reduction in costs." " I was disappointed not to have reached an agreement, but feel that the mediator did everything possible to try and reach a solution. The whole process was made as simple and 'painless as possible' and I felt confident to confide in the mediator and discuss all matters of the case." " … controlled the parties very well, being fair throughout, especially as the claimant was extremely entrenched… I would happily use you as a mediator & certainly would recommend your mediation services. " " Mr Singh dealt very well with a very complex and difficult case where there were serious issues to be resolved. " " It was a really useful and interesting observation ... One of the most valuable things I learnt was that it's possible and indeed necessary to be authentically yourself in one's practice as a mediator." " Would it be possible to observe another mediation with you when the opportunity arises? I say with all honesty, it was a privilege to be able to learn from you...This was an invaluable learning experience, I can’t recommend you highly enough, money well spent, and a must for any newly qualified, or even experienced mediators who want to observe an expert deploying his art!" " I was impressed with how quickly you responded & arranged the mediation…An amicable solution was found, which we are grateful for. I would be happy to endorse your employment mediation services and would recommend you to other HR professionals." " You were instrumental in bringing the parties in this three-year dispute to an acceptable solution …I felt you grasped the key issues …You focussed my client on the commerciality of this dispute, who did take significant persuading… you took charge, clarified matters very succinctly …"
" It was an extremely tense situation…however the mediation was conducted swiftly and to a satisfactory conclusion…You made us all feel at ease as we talked the delicate situation through…negotiations were conducted quickly and efficiently." " All of our workplace & employment mediation testimonials with just one click." " ... We found you easy to talk to, appreciated the calm approach you brought to this matter. You were flexible, arranging the mediation very quickly...dispute had been going on for several months, within four hours you helped the parties negotiate an amount which we deemed to be acceptable." " My advice to the client was to drop hands. Magically, and to be frank, I do actually think you were surprised also, you somehow managed to get my client a few thousand ...resolved this impossible situation within 3 hours"
" an IT software provider and a Law Services firm... outset the two directors were financially wide apart with their claims ... I was impressed by your neutrality and by concluding the disagreement within four hours. " " He appeared hugely experienced at obtaining a sense of how the parties wanted to negotiate and where a deal lay. I observed a comprehensive example of how to mediate a dispute." " He went above and beyond to ensure that I had understood the process, I would recommend him to anyone new to mediation looking for a good mentor." " Excellent attempts to mediate with a very difficult person.Excellent mediation ability and down to earth style." " ...to observe a dispute regarding property and other assets between two brothers. I also witnessed a style of mediation that I have not observed ... and may be able to employ these styles when needed in the future." " With little expectation of achieving a settlement. It was most impressive to observe Mr Bhurji in action...It was an amazing outcome and a most powerful illustration of the benefits of Mediation and in using a skilled Mediator."